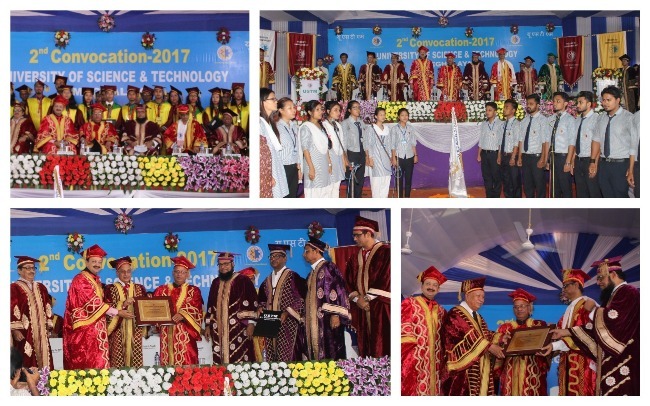 10th June, 2017, USTM : Amidst a packed audience University of Science & Technology Meghalaya had held 2nd Convocation at the Techno City Campus today at a gala ceremony. Three vice chancellors of the oldest universities in India, Prof. Ashotosh Ghosh, Vice Chancellor, University of Calcutta, Prof. Girish Chandra Tripathi, Vice Chancellor, BHU, Prof. Sanjay V Deshmukh, Vice Chacellor, Mumbai University, Prof Dhrubo Jyoti Saikia, VC, Cotton University, Prof. Dilip Chandra Nath, VC, Assam University, Silchar, Prof. G D Sharma, VC, Bilaspur University and many other distinguished and eminent academicians were witness to this august occasion. While delivering the Convocation Address Prof. Ashutosh Ghosh stated “USTM is truly the symbol of emotional integration of North East”. He also added that there is a need for bringing about improvement in quality of higher education and research and higher education needs to be viewed as long term social investment for promotion of economic growth. “The USTM, its founder Sh. Mahbubul Hoque has realized the need for quality education, research and development and I am happy that such a university has come up with a mission to bring about inclusive growth in the economy of North east by bringing the backward class of the society into the mainstream, by empowering the rural people through education” – Prof. Ghosh mentioned. Prof. Girish Chandra Tripathi, VC, BHU, Chief Guest of the convocation, started his speech congratulating all the students for their academic performance and wish them all success in future. He also emphatically stated that“ I was awestruck when I got to know that this university was established in 2011 with only with just seven students and within a few years it has expanded its reach beyond imagination”. He also asserted that the students may feel proud of the fact that they had availed all opportunity for higher education at USTM without stepping out of NE region, given the fact that education is the single most vital factor for the development of a nation as it leads to upgrade the upliftment of social and economic status of its people”. Prof. Sanjay V Deshmukh also spoke about immense potentiality that North Eastern Region does possess and he also appreciated the unstoppable Mahbubul Hoque whose consistent effort had made possible this dream come true. Affirming that the visionary approach of Mahbubul Hoque, the founder of USTM and its nationalist approach to bringing together different cultures, heritage, ethnicity of North East, is a testimony of its endeavor to achieve excellence and provide quality education to all, India’s unity in diversity. In the 2nd Convocation, a total number of 583 students had received degrees at different levels. A total number of 583 students which includes 518 students had received post-graduate degree, 61 students received under-graduate degree while 4 scholars will be awarded Ph.D degree. A total number of 26 students, both at UG, PG and Ph.D awardees were delivered with gold medals. Prof. Mihir Kanti Chaudhuri, former Vice Chancellor, Tezpur University was conferred with honorary D.SC and honorary D.Litt to Dr. D D Lapang, former Chief Minister, Meghalaya. “This is a token gesture of showing our reverence to both the scholar and the eminent politician ; Prof. Chaudhury has set an example to our next generation in the field of scientific research in chemistry, for his studies on the synthesis of dioxygen complexes and fluorine compounds of metals and non metals while Dr. D D Lapang, former Chief Minister of Meghalaya has laid immense contribution for the socio-economic development of North East” – USTM authority stated.